.All cute kids: All individual portraits. French fish must be very patient and helpful...........? On Monday Me , Chris & Cathy went to Harrogate. I had a session at it's Turkish Baths . It must be three years since I last went! It's still a bit like heaven for me ( 160 degrees in the top room). On Tuesday we went to see the surrealist photos of Lee Miller They were great . It's the first time I have been to The Hepworth. Very disappointed in the building itself.Its an ugly Stalinist mess. On Wednesday we went to Crawshawbooth Quaker Meeting House . It's over 300 years old & is the oldest Quaker building in the World.It's beautiful & caretaker Phil told me it has a ghost. We spent a couple of hours talking with the caretaker , Phil. Lovely bloke. I hope to visit again ( it's up near my friend Bob in Bacup). On Thursday I met with Ken in Halifax to drown his birthday. You wouldn't know it from these photos, I suppose, but it's been a very cruel week for me personally. Love the French Fishing postcard! :) And thanks for all the pictures - very interesting & my goodness, but you took a lot of them! Look at that kids shoes! His hair reminds me of my Uncle Louis Cleage. I was curious about the date, 1er Avril, April 1st, on your card. 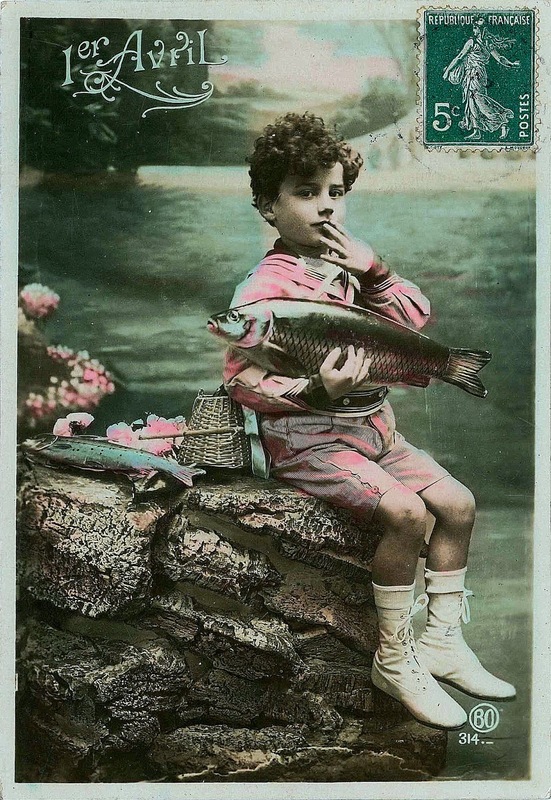 It seems that the French tradition for April Fools Day, which coincides with the end of Lent, is children pinning a paper fish onto the back of unsuspecting adults, “Poisson d’Avril” (April Fish!). Always love the music on your site. And those Turkish Baths look magnificent. Quakers! I may have discovered some Quaker ancestors recently. Can't be sure. Their name is Storrs from north Lancashire. Excellent French Fish post card...though hard to believe they could be that easy to catch!